The simple grid arrangement used by most Style Card systems is not immediately intuitive, and most people take a while to grasp the ideas behind it. To help in this learning process, different areas of the grid are given descriptive names, and sometimes also coloured as a key to the style that they are associated with. The diagram on the left shows one possible way of dividing the grid more meaningfully. This is only one of many different approaches, but it gives a broad indication of how the Style Card concept can be more easily communicated. Each of the coloured areas on this grid relates to a different style. Notice that most of the coloured areas contain more than one grid square, because a number of related styles have been grouped together under one general heading. This gives only nine basic types to consider, instead of an unwieldy twenty-five. Each of these sections is given a name deriving from the basic type of behaviour it describes. Naming conventions vary widely according to particular implementations of the Style Card idea, but those given here are fairly typical of the naming styles used by different systems. The most important areas on the grid are the large sections at the four corners. Each of these contains four smaller squares, and relate to four basic types. They also, incidentally, relate directly to the four DISC factors, as we shall see later. Driver: the top-left area, shown in red, describes behaviour containing both Assertiveness and Control. 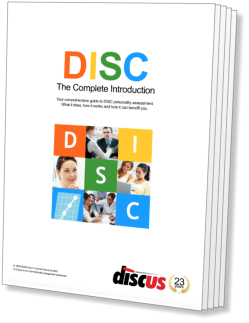 This section relates to the DISC factor of Dominance, and describes a direct, demanding type of person who is highly motivated to succeed and somewhat competitive in their dealings with others. Communicator: to the top-right, the yellow area covers a combination of Assertiveness and Openness (relating to Influence in DISC terms). This type of person is communicative and sociable, being friendly and outgoing with other people and feeling at ease in strange company. Planner: the bottom-right section of the grid, shown in green, describes a steady, amiable type of person and relates to the DISC factor of Steadiness. People of this kind are patient and persistent, dislike change, and like to take time to plan carefully before acting (hence the name of the style). Analyst: the final area lies to the bottom-left of the grid and relates to the DISC factor of Compliance. It is coloured blue in the illustration above. Analysts, as people of this type are known, combine Control and Receptiveness, and are structured, organised individuals who tend to follow the rules whenever they can. They are interested in precision and order. Between these four main sections of the grid, you will notice four intermediate areas, coloured orange, lime, turquoise and purple. These represent styles that combine elements of two of the main styles described above. 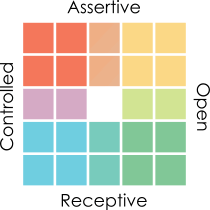 Assertive: the orange section lies between the red Driver type and the yellow Communicator type. Individuals lying in this area share the assertive element of both these types. In terms of openness and control, however, they lie between the two extremes, sometimes being friendly and open, while at other times being capable of more controlled behaviour. Open: On the right-hand side of the grid, between the yellow Communicator and the green Planner, lies a lime-coloured section. Individuals that fall into this part of the grid are primarily open in style, defining themselves in social terms. They may be Assertive or Receptive in approach, however, depending on circumstances. Receptive: to the bottom of the grid, between the Planner and the Analyst, lies a blue-green area dedicated to Receptive styles. These people are retiring and unobtrusive, and are reluctant to act unilaterally. They may be amiable in approach, or simply reserved and unresponsive, depending on their particular circumstances. Controlled: the final intermediate area is the purple group to the left of the grid, between Analyst and Driver. As the name suggests, individuals of this type will be controlled and reluctant to provide information about themselves or their ideas. They may be Assertive or Receptive in approach, however, depending on the situation. Balanced: the final element of the grid is the central square, shown white in the diagram. A balanced (sometimes called a 'neutral') style simply cannot be defined under this system. Their behaviour is likely to incorporate elements of all the main styles from time to time. The Balanced style is equivalent to a DISC 'Compressed Profile'.